Plans to build a new airport in Siem Reap that will be funded and operated by a Chinese company are almost finalised. Last October, the Cambodian government reached an agreement with China’s state-run Yunnan Investment Holdings Ltd (YIHL) to build a USD880 million airport in Siem Reap. Phnom Penh Post reported that the State Secretariat of Civil Aviation has assigned a team to provide technical and regulatory oversight for the construction of YIHL’s greenfield airport. The team will help with the initial evaluation as well as to assist with any other technical challenges that might arise, the SSCA spokesman, Sin Chanserey Vutha, said. YIHL has submitted documents for the airport to the Council for Development of Cambodia (CDC), while the group also established a local subsidiary, registered with the Ministry of Commerce under the name Angkor International Airport Investment Cambodia. The existing airport might continue to operate possibly serving just domestic services. The new airport will be built in Sout Nikom district, about 50 km from Siem Reap. 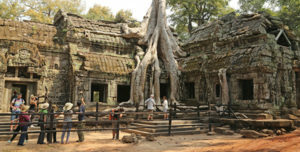 Flight restrictions over Angkor Wat were blamed for the need to phase out the present airport and develop a new site. The new facility will also double the present airport’s capacity of 5 million visitors a year. The agreement gave YIHL and its construction and airport management subsidiaries an exclusive 55-year build, operate, transfer (BOT) concession, replacing the current exclusive agreement with Cambodia Airports, a company majority-owned by France’s Vinci Group, which was set to expire in 2040. The government is ready to move forward and will negotiate compensation with the present operator, Cambodia Airports. Khmer Times quoted the provincial governor, Kim Bunsong, saying the construction is due to start by the end of this year or early 2018. Siem Reap welcomed 1,954,708 international visitors for the first 11 months of 2016, a 2.8% increase from 1,901,646 visits, during the same period in 2015, according to Ministry of Tourism’s Statistics and Tourism Information Department’s data.